Recipe for Turkey Stock, Idea for Thanksgiving Tablescape and an Idea for Giving. I am tickled to be joining my great group of friend for this Thanksgiving Blog Hop. When I count my blessings this Thanksgiving, this group will be among my many blessings. There is a lot packed in to this post as I am sharing Thanksgiving Ideas for the Table, the Food and (the) Giving. One of the things Kate and I have always loved doing together is to decorate for the holidays. When she was home last week for a quick fall break, we took the opportunity to figure out our Thanksgiving Dinner table. We hit up our local Michaels and shopped our home to put together a Thanksgiving table that we both are quite tickled with. The punch bowl that my mom gave me years ago and that has been sitting up in my attic for way too long became the ‘vase' for our floral and feather arrangement. 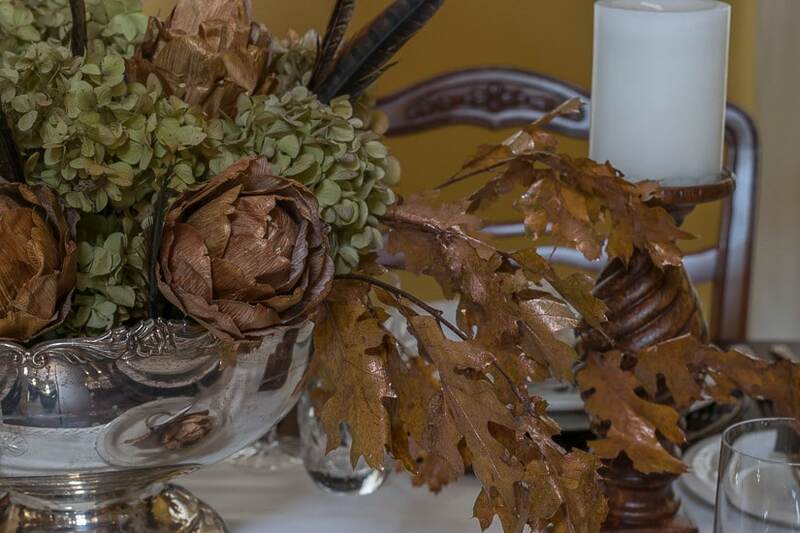 We used silk artichokes, gold-tinged leaves, pheasant feathers and dried hydrangea from our neighbor's yard to fill the punch bowl. (in addition to the jasmine on the front porch, my hydrangea was another victim of my yard boy (aka my 17-year old son) this summer). The crystal that sits in my china cabinet for 363 days out of the year came out, as did the silverware that belonged to my grandparents. I am really trying to be better about using my china and silver on a more regular basis. I found these chargers at Michaels and they are just perfect for Thanksgiving. And I got them at a B1G1 deal…SCORE! I was originally thinking about a brown toile tablecloth for Thanksgiving, but was having a hard time finding one. When I saw these I knew it was that kismet thing. I can't find them on-line…if you're hoping to find them you might try your local Michaels…and keep your fingers crossed. We ‘made' the placecard holders by bending the wire stem of the silk artichokes and placing the name card in front of one of the oak leaves we pulled from a stem left over from the centerpiece. I am using the linen napkins that I made for Thanksgiving last year. You can see this easy tutorial here. Wine glasses are always to the right of your water glasses. How could I possibly talk about Thanksgiving Preparations without sharing our recipe for Turkey Stock, which we use to make the very best gravy on Thanksgiving day. It's so easy to make this stock ahead of time and put it in your freezer until you need it. Place turkey wings on roasting pan, brush with olive oil and roast for 45 minutes until golden brown. Remove the turkey wings and reduce temperature to 350°. Add chopped vegetables to the fat that was rendered while your wings were roasting, put in oven and roast for 15 minutes. Then put the veggies into the stock pot with the wings. At this point, I measured from the top of my pot to the water level because that's where I'm going to want the level to be when it's adequately reduced. Add 8 more cups of water, put it on the stove and simmer for 5-6 hours very slowly until the stock has been reduced to 7-8 cups. Once it cools a bit, strain it and pour it into your fat separator and let it sit for a couple of minutes so that the fat can rise to the top. I save the fat and freeze it for future use. If I have a turkey breast and Terry is hankering for some gravy, I can use the fat to make the roux for a quick gravy. Pour your stock into freezer-safe jars, making sure to leave a good inch plus to allow for expansion, and freeze until the day before Thanksgiving. Take them from your freezer, put them in your fridge and send up a little thanks when you taste that amazing gravy on Thanksgiving Day. As far as making the gravy, there are 2 methods I use. One is to make a roux with equal amounts of flour and fat (about 4 TBSP each) and whisk it until it is a nice light brown and smells a little toasted. Then I'll slowly whisk in 4 cups of my turkey stock and add salt and pepper to taste. The second is to use the drippings from the turkey. I bring that to a simmer and slowly whisk in a slurry of 1/4 cup flour and 1 up water/broth and about 3-4 cups of the stock. This is seems to be a richer and more flavorful gravy. And we can't end a post about Thanksgiving without sharing with you an opportunity to put our thanks into action. Now is the time to prepare your shoeboxes for Operation Christmas Child through Samaritan's Purse. Over 125 million boxes containing toys, hygiene and school supplies have been donated throughout the world to children in need, regardless of their faith. If you are looking for a way to put your thanksgiving into action, this is one of many way to do that. Simply pack a shoe box with a couple of toys, school supplies, basic hygiene supplies or craft supplies and take to a collection center near you. Collection week is November 14-21. This link provides some great suggestions on what to put in your box, how to pack and label your box. This link will help you find a collection center near you. And if you need a few ideas of what to put in your box, here's what's going in two of my boxes. Well my friends, I hope this has got you thinking ‘Thanksgiving'. It will be here before we know it. I'm looking forward to having Kate back home and to ‘do' our family's Thanksgiving traditions. Thanks for stopping by to visit today, I appreciate you more than you’ll ever know. And when you leave a comment…ah, it makes my heart sing! I have published printable PDFs of several of my most popular knit patterns and printables and have made those available to all of my subscribers. And come back and check every now and again. I will continue to add patterns and printables to this page as we go along. So, if you’d like to get in on the ‘subscriber benefit’ action, simply subscribe to Nourish and Nestle using the form on the right sidebar. It’s towards the top a bit. I have sent all my subscribers the link to the Subscriber Benefits Library, but if you missed it or misplaced it, drop me a line. Lynn, I absolutely love your centerpiece! My mom often uses a silver punch bowl for her flower arrangements, so this reminds me of being back at home. I never thought to make turkey stock ahead of time and freeze it. I usually end up using chicken stock and turkey drippings for my gravy, but this sounds so much better! Thanks so much for sharing! Hey Robin…thanks for swinging by today my friend. You clearly need to ‘borrow’ your mom’s punch bowl! Or find one at a thrift store…I would imagine that they aren’t too hard to find…don’t think people serve punch so much anymore. And give that stock a try…it’s so yummy…and your house will smell like thanksgiving day, which is a good side benefit. Lynn, Your table and centerpiece are gorgeous, and I love your recipe and how you make your turkey stock ahead of time. I always do mine the day of, in the middle of chaos!, Hugs my friend! Hey there Carol…it is a good feeling to know that I have a start on Thanksgiving and it’s sitting int he freezer. Plus, Terry LOVES turkey and gravy and I have enough that I can whip up a batch of gravy anytime. Thanks for swinging by today my friend. That Turkey stock looks delicious, I just might try that for this year! and we always donate to Samaritans purse, so thanks for sharing that to your readers. Hi Nicki…it’s pretty good stuff and it’s good to know it’s in your freezer and ready for the big day. And I always like knowing that I’ve helped some child somewhere to have a good day. And now that my kids are older, it’s fun to shop for stuff for little ones. Lynn, I just found your blog hopping over from Carol at the Red Painted Cottage. i really like your style and the tables ape is beautiful. I look forward to future posts heading into my favorite holiday! Hi Loryl, I am so glad you popped over from my friend Carol. Isn’t she fantastic!? She is clearly one of my blessing from this year. And I’m so glad you like my tablescape…my daughter and I had a fun time putting it together last weekend…one less thing to worry about the week of thanksgiving. Thank you so much for coming by today and hope you have a wonderful weekend. Your thanksgiving table looks amazing! I love using regular pieces for flowers and that punch bowl is perfect. You sure know how to pull all the details together for a stunning result! Aw thanks Tammy. It was a fun thing to do with Kate over her fall break and I’m glad to have it nailed down for Thanksgiving! One less thing to do the week of Thanksgiving. Thanks for swinging by my friend. Knife, spoon are 5 letters go on Right (5 letters) side of plate. Easy to remember!!!! Thanks Norma! I’m so happy to have begun the preparations a bit…less to do the week of! Thanks for swinging by today. Lynn, your plate settings and dinner table look so elegant. Definitely made for having guests eat over. Thanksgiving is so close, I’ve yet to make any preparations, Thanks for the early reminder and tips. Thanks Marjo! I’m getting ready for Thanksgiving and having the table setting planned out and the stock in the freezer are two biggies out of the way. I hope your Thanksgiving prep is starting to come along and wish you the happiest of Thanksgivings. Lynn – shared this in my FB group and it was very well received. Sharing in my newsletter today! Thanks so much Cathy! Appreciate all the love and hope all is well in your world. Lynn, your centerpiece and place settings are so pretty and festive! Happy early Thanksgiving to you! Thanks Liz! I hope you and yours enjoyed a wonderful, but relaxing, Thanksgiving. These are great ideas Lynn particularly the idea of giving back. I strongly agree that putting Thanksgiving into action is the best way to celebrate this holiday. Let’s share our blessings to others by donating toys, school supplies and other things these children need. There are other ways to give back like by volunteering in nursing homes and other long term care facilities or by participating in a soup kitchen or local food drive. You can check VolunteerMatch.org to find events near your area. This is from the list I created, 35+ Thanksgiving activities that every family member can enjoy. Here’s th list: http://www.altcp.org/weekly-digest-35-ways-thanksgiving/. Hi Samantha, I am so glad you stopped by and linked to other great volunteer opportunities. There is so much need in our world and every little bit helps. I hope you enjoyed a lovely Thanksgiving! Oh Sheila my friend, you sure do know how to make a gal feel good!Thanks so much for your kind words…and yes…that stock is the bees knees!